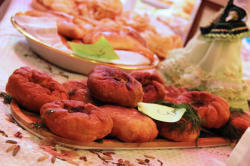 From hearty pies and stuffed bread, Tatar cuisine is absolutely mouthwatering delicious. 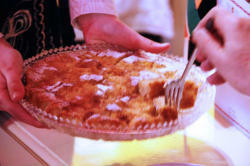 Developed over thousands of years, traditional dishes continue to be part of a proud and abundant cultural heritage. 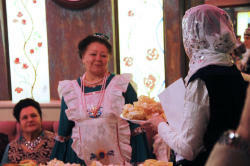 Tatar cuisine has also become surprising discovery for many foodies in Baku. 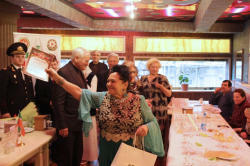 An evening timed to Day of Tatar cuisine has been organized by Tatarstan Public Association and Salam Tatarstan International Center in the capital of Azerbaijan. 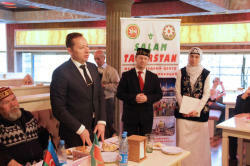 Addressing the event, chief culinary specialist at Azerbaijan Culinary Center Tunzala Mammadova delivered a greeting from the center’s general director, the President of Azerbaijan Culinary Asociation Tahir Amiraslanov on the occasion of Day of Tatar cuisine. 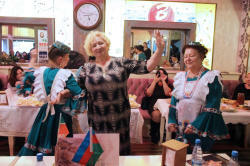 She stressed that such events strengthen the friendship of the peoples in Azerbaijan and preserve their traditions. 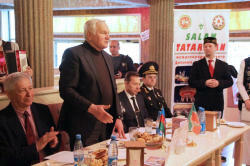 The Deputy of Tatarstan Public Association, the head of Salam Tatarstan project Emin Ramazanov talked about the history of celebration. 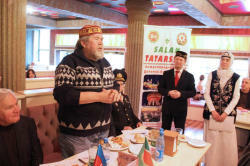 He also spoke about traditional Tatar dishes and national delicacies, without which there is not a single Tatar holiday. 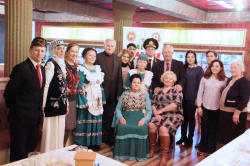 Ramazanov noted that celebration aroused interest among young people, which in turn serves to preserve and transfer traditions to new generation. 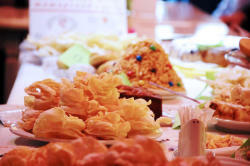 A competition was organized for the preparation of traditional Tatar dishes, including tokamach (home noodles), chak-chak (desert), ochpochmak (pie), kosh tele (desert), peremyachi (pie), belesh (pie), etc. 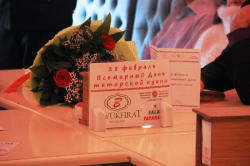 The jury member Chairman of the Tatarstan Public Association Abas Minashev, the head of Lukoil-Azerbaijan CJSC Eduard Mukhametov, President of the Dede Gorgud Foundation Eldar Ismayilov and a science fiction writer, member of the Writers' Union and the Journalists Union of Azerbaijan Aleksander Hakimov have identified the winners. 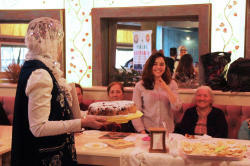 The first place was taken by the Tatar delicacy chak-chak and homemade noodles prepared by Alsu Yusupova, the second place went to sweet pilaf and cake with the curd by Tadjiba Babayeva, while Razza Alieva’s peremyachi (pie) ranked third. 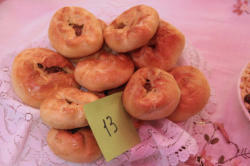 The contest brought together the Tatars, Azerbaijanis, Russians and Lezgins, who for the first time tried to cook the national Tatar pastries. 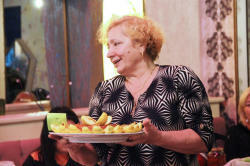 Each guest could try soup from home noodles - tokamach, as well as taste national Tatar pastries. 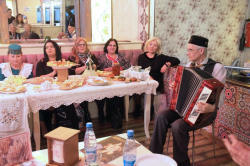 The celebration featured Tatar songs performed by ensemble “Ak kalfak” and accordionist Ismail Safin. 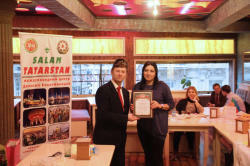 Among the guests of honor were the head of the Turkish restaurant Buyukfirat Zalina Agabayova, the representative of Azerbaijan Union of Cossacks, ataman Sergey Samuylov, representatives of the Matryoshka Association and others. 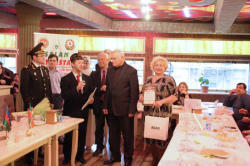 Day of Tatar cuisine was established in 2006 and is celebrated annually on February 28 in Russia, CIS countries and abroad on the birthday of the famous chef Yunus Akhmetzyanov - a master of Tatar cooking, the author of numerous cookbooks. 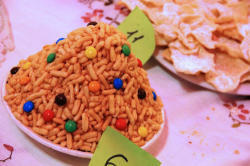 Many workshops, traditional feasts are organized as part of celebration.